The numbers listed above are all prime. Based on this evidence Fermat conjectured that all numbers of the form are prime. But Euler crushed this dream by showing that the next Fermat number, is not prime. and so on. 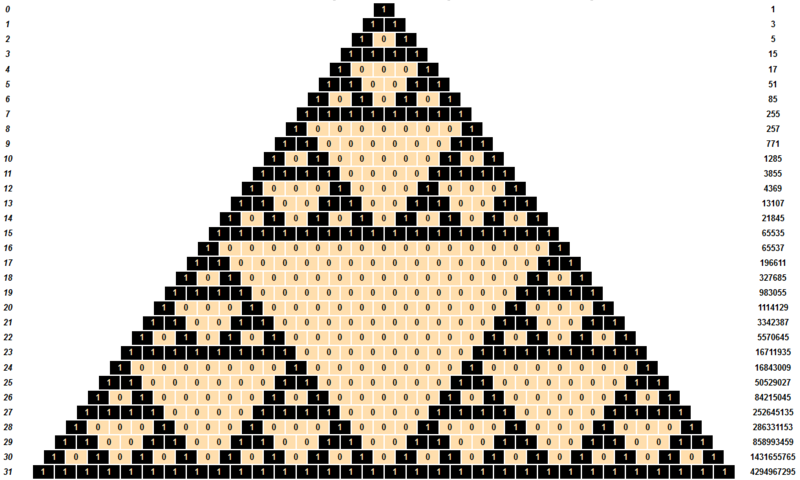 Also show that every product of distinct Fermat numbers corresponds to a row of Pascal’s triangle mod 2. What is the pattern? By the way: the first row, 1, corresponds to the empty product. Now, Gauss showed that we can construct a regular n-gon using straight-edge and compass if n is a prime Fermat number. Wantzel went further and showed that if n is odd, we can construct a regular n-gon using straight-edge and compass if and only if n is a product of distinct Fermat primes. Gauss–Wantzel Theorem. We can construct a regular n-gon using straight-edge and compass if and only if n is a power of 2 times a product of distinct Fermat primes. There are only 5 known Fermat primes: 3, 5, 17, 257 and 65537. So, our options for constructing regular polygons with an odd number of sides are extremely limited! There are only options, if we include the regular 1-gon. Puzzle 3. What is a regular 1-gon? What is a regular 2-gon? And, as noted in The Book of Numbers by Conway and Guy, the 32 constructible regular polygons with an odd number of sides correspond to the first 32 rows of Pascal’s triangle! because Euler showed this Fermat number is not prime. So, we’ve hit the end of the road… unless someone discovers another Fermat prime. This entry was posted on Tuesday, February 5th, 2019 at 5:53 pm and is filed under mathematics. You can follow any responses to this entry through the RSS 2.0 feed. You can leave a response, or trackback from your own site. I considered it but thought it might confuse some people. You should be be glad to know that at least I felt a pang of guilt for leaving it out! You included it in Puzzle 1, so maybe they'll be confused when it doesn't appear this time? I was. But I like how this bootstraps the beginning of the Fermat numbers. I say ‘I want a Fermat number!’. You say ‘Well, just multiply together the ones that you have, then add 2.’ (which doesn't work if I obtain them out of order, but never mind that for now). I reply ‘But I don't have any Fermat numbers yet!’, but you reply ‘Don't worry, just do what I said: multiply all none of them together to get 1, then add 2 to get 3.’ and now I've got my first Fermat number out of nothing. Ah, but 1 is not a Fermat number anyway, since one should add 1 to a power of 2, not subtract it. Of course, and that explains why John deleted that from his comment too! That’s good then, not have even that exception. I was probably mixing up the Fermat numbers with the Mersenne numbers . I believe Mandelbrot’s book The Fractal Geometry of Nature has a lot of discussions of early work on fractals, one of the themes being that this work was not considered “serious mathematics”. So that’s where I’d start.